Just an hour or so from both the ski slopes and the beach, the Spanish conquistadors who founded Santiago clearly wanted the best of both worlds – and not just the old and new ones. 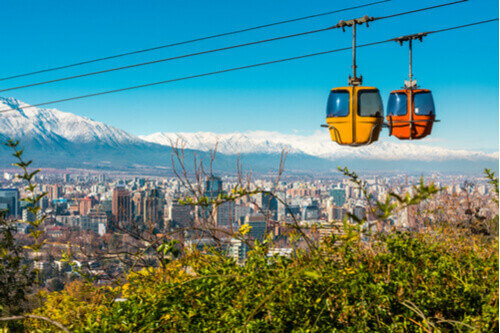 A modern city with a historic heart, the Chilean capital is home to around seven million people – a whopping 40% of the national population – making it the country’s largest city, cultural hub and economic engine. 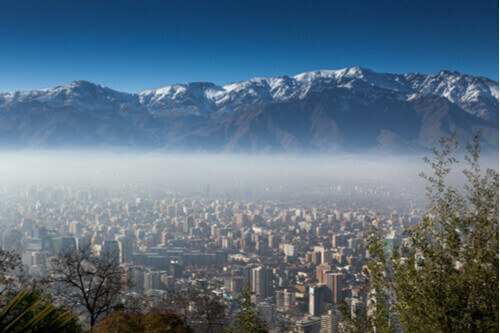 Santiago sits near the middle of this long, thin mountainous country, which at 4,270 km from top to tail is as tall as Australia or the continental US are wide. Just like Chile itself, geography has dictated Santiago’s boundaries; the city sits on a broad fertile basin which is almost surrounded by mountains – the Chilean Coastal range to its west, the Andes to its east with Andean spurs, the Cordón de Chacabuco and Angostura de Paine to its north and south. This walling-in of a modern city has familiar consequences – smog – but thankfully, authorities are addressing the situation, and have banned wood-fueled fires and rolled out electric buses and several new metro lines to take traffic off the roads. The city also has an enviable network of urban bike trails, which allows locals to take a two-wheeled commute and tourists to pedal about the city at their leisure. 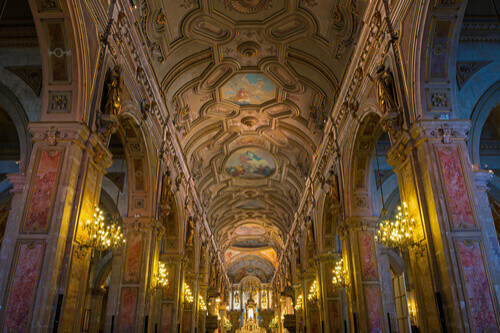 When it was first built in the 1500s, Santiago’s charming old town – known as El Centro – was originally laid out in a grid pattern, with the Metropolitan Cathedral at its heart. This district is the perfect venue for a leisurely promenade along its poplar fringed avenues lined with charismatic colonial architecture. 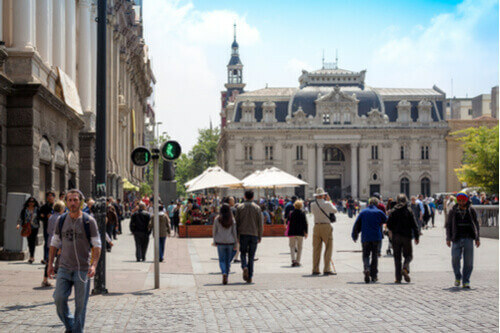 Highlights include the main square, Plaza de Armas, and the busy pedestrianised Paseo Ahumada – Santiago’s answer to Barcelona’s Las Ramblas. Make sure to visit the elegant La Moneda Palace (currently sitting on the UNESCO World Heritage tentative list); this one-time neoclassical mint turned presidential palace still bears the scars of President Salvador Allende’s last stand as he was overthrown in a 1970 coup. Lunch at a stall in the fish market (Mercado Central), maybe pop into the city’s main fruit and veg market, La Vega Central, and then get your fill of culture at the Chilean Museum of Pre-Columbian Art, which houses one of the world’s finest collection of ancient artifacts from across central and south America. If you like your history more modern and grizzlier, then head to the Museum of Memory and Human Rights, which documents the fates of those who disappeared under the military government’s brutal reign through the 70s and 80s. A small memorial park, Parque por la Paz, also stands where the secret police’s offices used to be. The flat Santiago basin is punctuated by a number of steep hills, thankfully turned into impressive parks, such as Parque Metropolitano. A funicular railway and cable car run up to the top of the Cerro San Cristóbal, a place to gaze at the heavens, with an observatory and a statue of the Virgin Mary – the city’s answer to Rio’s Christ the Redeemer – under which Pope John Paul II held Mass in 1987. The park also houses a botanical garden and a petite zoo. Outside the city in the Andean foothills sits the striking structure – it looks like a huge rooftop air vent – of the Templo Bahá’í (Bahá’í House of Worship of South America). The Bahá’í faith preaches the merits of all religions in a sort of spiritual Esperanto. 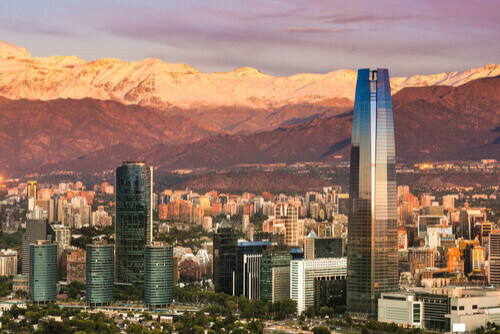 From sleepy colonial backwater to the center of a totalitarian state and to one of Latin America’s most vibrant, modern and prosperous capitals – Santiago’s varied history is what makes it such a fascinating place to visit.